Join Bay Fish N Trips on fishing trip adventure departing at the Mornington Pier. Venture out onto Port Phillip Bay in the historical vessel Plover, housed with modern facilities, for a four or five hour charter to catch some fish and to enjoy the other delights of this natural environment. A sumptuous BBQ lunch and light refreshments are included on every trip. After returning to Mornington you can then make your way to Red Gum BBQ, only a 20 minute drive. 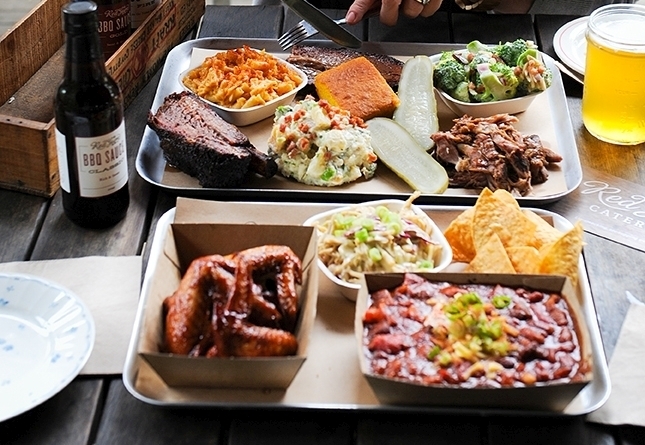 Australia’s BBQ Mecca and the Peninsula’s coolest BBQ & Beer Hall. Here you can enjoy a scrumptious Share Platter with an optional craft beer tasting paddle. BBQ with choice of a tender Porterhouse steak, beef sausages (2), a fish patty (sweet potato & fish) or a gourmet vegetarian burger (lentils & seasonal veggies) in a sandwich with caramelised onion, crispy green salad and ripened tomatoes. Please order your protein at the time of booking. Drinks - tea (Black, Oolong, Green, Peppermint), coffee (Nescafe Espresso) and cordial. Beef Brisket and Pulled Pork, broccoli salad, cornbread, dill pickle and a chocolate Brownie and a glass of beer or wine (guest to choose on the day). The package suits groups of 2 to 10 people. Price: $134 per adult (5 hr shared fishing trip) or $124 per adult (4 hr shared fishing trip). If you wish to add in a beer tasting paddle per adult, the cost would be $140 or $130 respectively. Call Sandra, Bay Fish N Trips on 0418 349 364 for other information or to book your package. NB. Subject to availability. Fishing trip is weather dependent - if cancelled due to inclement weather, money for the fishing trip will be refunded and suggestions made for an alternative activity but the Red Gum BBQ will continue as booked. Not available on Public Holidays. Fishing licences can be arranged.